Last season, many of the Apple Valley boys' hockey players were too young to let a surprising state tournament run faze them. How well those returning players could deal with the early-season buzz would dictate whether the Eagles end their season among the state's elite once again. The Eagles opened the season with a 6-3 victory against Bloomington Jefferson on Tuesday night at the Jaguars' Ice Garden. A three-goal second period, including two from junior forward Trent Heuer, put the Eagles in charge. "This game meant a lot; it felt good," Heuer said. Standout forwards A.J. Michaelson and Hudson Fasching each scored for the Eagles, but less-heralded players such as Heuer showed that No. 7 Apple Valley is much more than a dynamic duo. "We have a lot of guys who played well on youth teams growing up," Heuer said. "We just tried to go out and do what we know we can do." Fasching showed why he is one of the state's top young forwards, a player capable of turning a harmless play into a scoring chance. A puck deflected off a teammate's skate in the neutral zone and Fasching pounced, rushing to the Jaguars' net for the game's first goal at 14:21 of the first period. The Eagles' Kris Goodman appeared to have added a power-play goal at the buzzer, but the officials waved it off. Instead of starting the second period down 2-0, No. 13 Bloomington Jefferson tied the game on Austin Hunt's goal at 2:12 of the period. 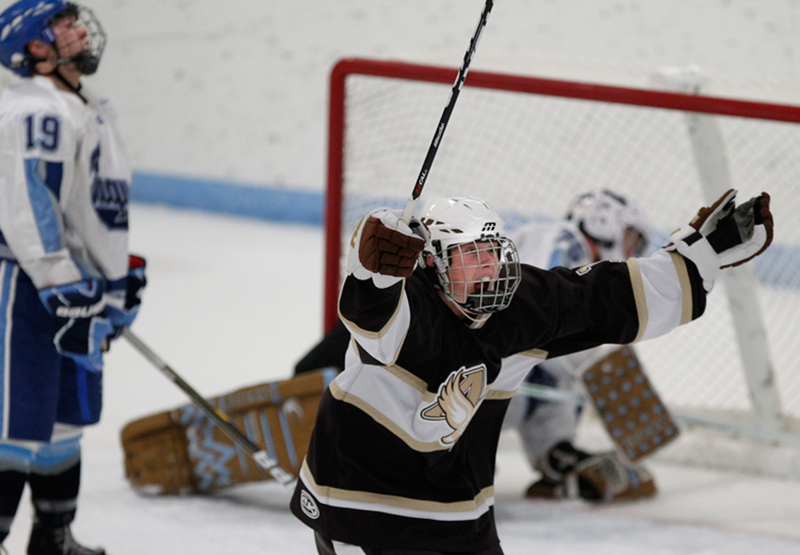 Crashing the net allowed Apple Valley to score the next two goals just 12 seconds apart. Michaelson tucked away a power-play goal, followed by one from Heuer just after a penalty expired. Only 36.9 seconds remained in the second period when Heuer struck again on a centering pass from Goodman. "It was nice to get a quality win right away," Fasching said.